Nothing to do with Blake's 7 but Judith is actually in real print! In an anthology of Dracula stories set in London edited by P.N.Elrod along with many other well known writers is a story by Judith. It even gets a special mention in this review from Amazon. Dracula lives! but more in name than spirit in 16 new period riffs on his legend. 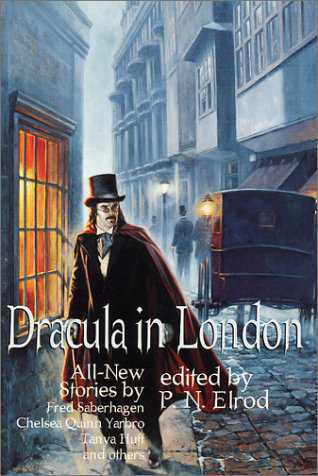 Going back to Bram Stoker's original novel, Elrod (Time of the Vampires) asked contributors to this anthology, "What ELSE was Dracula doing in London when he was not being chased by Van Helsing and company?" Chelsea Quinn Yarbro, in "Long-Term Investment," and Fred Saberhagen, in "Box Number Fifty," both have him duping ignorant human associates into elaborate schemes to conceal his coffins. Tanya Huff suggests he was drawn to social climbers and other predatory personalities in "To Each His Own Kind." In one of the book's most intriguing entries, Judith Proctor's "Dear Mr. Bernard Shaw," he is a theater patron who cannot understand how the deaths at the end of King Lear ennoble human suffering. Inevitably, Dracula rubs shoulders with a variety of Victorian-era celebrities, including Gilbert and Sullivan, Doctor Watson, Prince Edward, actress Ellen Terry and even a young Aleister Crowley. Inventive though they often are, few of these stories capture the subtle malignancy and terrifying misanthropy that has made Stoker's creation an indelible horror icon. Excepting Gene DeWeese's "An Essay on Containment" and Gary A. Braunbeck's "Curtain Call," which attempt to be more than mere outtakes from Stoker's tale, the majority are modern revisionist interpretations of Dracula as lover, dreamer, swashbuckler and bungler. For better or worse, they bear out the editor's professed fondness for any Dracula variation, "good and bad, sublime and silly." Order the book from Amazon (It is only published in the US). Last updated on 13th of December 2001.